Come into our London Photo Studios in Camden London for fabulous creative images and give yourself a well deserved treat. We have experienced fashion, boudoir, and glamour photographers who will put you at your ease and you will love the results. * You will need to let us know in advance how much time and how many costume changes are planned. We take a booking deposit of £50. This includes professional makeup, and at the end of the shoot we give you one digital image and a FREE A4 size print. Further images are £25 each and include light retouching. Should you wish to buy all the images from the photo shoot the price goes down to as little as £5 per image. We normally ask you to come in with your hair ready styled. Hair styling in the studio is available and costs an additional £15. You are welcome to do your own hair and makeup. If this is the case, we take a booking deposit of £25. The cost includes a retouched digital image and an A4 size print. 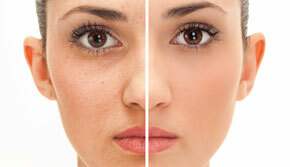 Light retouching is done to a selection of images and is at the discretion of the photographer. Creative retouching, body reshaping, digital lipo suction, and prolonged retouching to face and hair is charged for with pricing starting from just £10 per image. Make your dreams come true TODAY. Contact us on 020 7387 9882. Have a look at our model potfolio photo gallery or visit our NEW web site www.studios4u.co.uk for full details of what we do and to see some breath taking and iconic boudoir, glamour and fashion photography. You will need to pay a deposit of £25, or £50 if you are booking our makeup artist. This can be done over the phone by credit or debit card or you can pay your deposit online using the link below. Please be aware that if you wish to change or cancel your booking, we need 48 hours notice or you will loose your deposit. 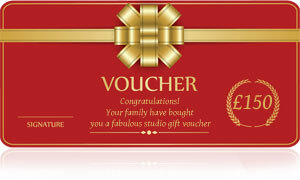 Why not surprise the one you love with a Gift Voucher for one of our fabulous photo shoots? Hen party studio makeover shoots start at just £25 per girl and are a fantastic way to kick start the day's celebrations. Affordable, jaw dropping makeover photo shoots are available in our studios. We do your makeup and hair for but you are also welcome to do it yourself. Give your company profile a boost. Business headshots either in our London studios, your office or at a location of your choice. That's right - just £25 for a baby studio shoot lasting up to an hour. Included in the price is a digital image and an A4 size print.